Record a quick audio question and I will reply with an audio response – simple! 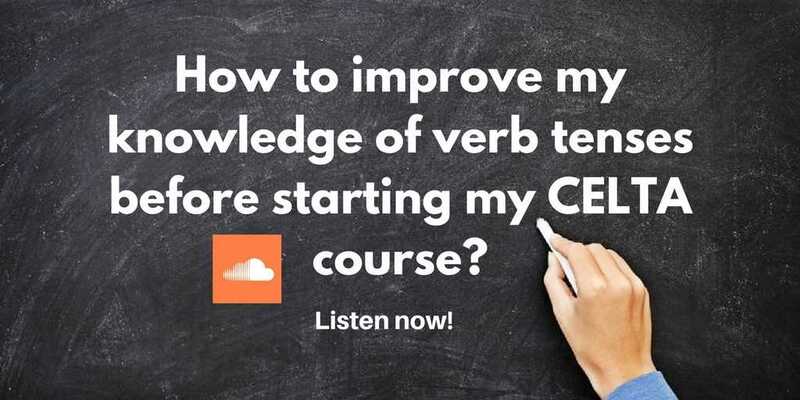 Dear Steve, I was told at the interview for my CELTA course to work on my tenses, as this was the part I struggled with the most during my exam interview. I have two months to improve my knowledge as I start my CELTA course in September. Any tips on how to do this would be helpful. Thanks, Heba. Okay, so to work on your tenses, the first thing I would suggest is using a book like English Grammar in Use by Raymond Murphy. I’ve always found that to have very clear explanations, although sometimes some of the tenses can get a little bit confused. However, most of it’s very clear. Also, another book that I haven’t used much, but comes highly recommended is Teaching English Grammar by Scrivener. A lot of people really, really love this book and they say it was very helpful, especially at the CELTA course level. If you want to go on a website, I recommend a website called Grammar Bytes (but the actual address is chompchomp.com) And that is a really nice, clear website that keeps everything very simple, breaks it down, has some stuff on tenses, has got a bit on everything. They like their, as you can imagine, grammar on that site, because it’s Grammar Bytes. Have a look on there, there’s lots of free resources and things you can download as well. So, I hope that’s helpful. Oh, I almost forgot. Two books I really like to use for games for tenses, for teaching them at least … Cutting Edge, and you go into the teacher’s resource pack, or the teacher’s book, the resources section, which is usually at the back, and that’s like a spiral bound book, they’re quite distinctive. Usually, the pre-intermediate and intermediate have the most activities, because they’re the lower levels. Or you could also find Reward Resource Pack (used is fine). That was another one that’s great for photocopying activities, plenty of activities on tenses in there, in the pre-intermediate level and maybe the elementary and beginning levels. So have a look in there, they got loads of games ready made for you for your specific tenses. And good luck on your CELTA course – come back to me with any other questions, and I hope that was helpful. And I’m looking forward to the next question from anyone for preparing for their CELTA course, just send them in and I will get back to you as soon as possible.